Imagine the thrill of thinking that you may be related to a United States Senator and more so, that he was President pro tempore, third in line for the highest office in the land. That’s exactly what went through my mind recently as I researched my maternal great great great-grandparents, James and Martha Ross. But, as the dates came into focus, and even though both parties were from the Western Pennsylvania frontier, I learned that the namesakes were born about a half-century apart. Could there still be a connection between these families? Yes, it’s possible, but we’ll save that conjecture for future research, although we’re including a brief Senator Ross biography later. The main purpose of this article is to explore the lives of my hardworking ancestors, their surname, and some other famous namesakes, and pose several questions, including what happened to their earthly remains. Who was Jane’s mother? A reference to her in the 1904 Memoirs of Allegheny County biography of my Great-grandfather William James Campbell (1859-1954) simply says that his grandfather married a “Miss Anderson of Pennsylvania” (1). If Thomas Anderson Campbell married Jane Anderson Ross, were they somehow related? The Scots-Irish custom was to use a maternal surname as middle name for male babies. Distant cousins sometimes married each other in those days as the pool of available mates was somewhat limited. Also, as each family emigrated from Northern Ireland, the families could have known each other in the old country. Who were the Ross’s of Missouri with whom James is buried? The above mentioned Memoirs says that James died and was buried in Kirkville, MO, and cemetery records confirm that. If, as the 1904 article says, Martha return to Pennsylvania to live a long life, with whom did she live and where is she buried? Was the other West Deer Ross family in the 1840 Census, including widow Catharine, somehow related to our James? After we discovered the listing of Martha as James’ wife in the 1850 census, we found several other Allegheny County James and Marthas on the genealogy message boards. These names were apparently common to the Ross family and the area (2). Our James and Martha’s names appear on Thomas and Jane’s 1863 property indenture, answering the name question once and for all. Not so incidentally, a John and Mary Anderson also appear on the document. Could they, as previous owners, have been either Martha’s parents and/or related to Thomas Anderson Campbell? That’s research for another day. but for now let’s save the other two questions above for the end and move to the background of the Ross name and consider some famous persons who have and are using it. Fourth Earl William (1312) witnessed Robert Bruce’s treaty with the King of Norway and his letter to the Pope (1320) at the Battle of Bannockburn asserting independence. This William’s granddaughter married the brother of Bruce. Alex Ross (b. 1970), of Oregon and Texas, illustrator for Marvel and DC comics, is best known for colorful conceptualizations of Superman, Spiderman, Batman, and many others. Our final Ross, an actual namesake and U.S. Senator from Pittsburgh, may be accessed from any American history book or online search. NationMaster.com says that this James Ross was born in York County, PA, in 1762 and, after receiving a “classical education,” moved to Canonsburg, just south of Pittsburgh to teach Latin at what would become Washington & Jefferson College. He studied law and was admitted to the bar. As a Federalist he helped draft a new constitution for Pennsylvania in 1789. Being from Western PA, he was appointed by George Washington to settle the Whiskey Rebellion, America’s first civil war. In 1794 he was elected to the U.S. Senate for two terms, where he was named President pro tempore. After moving to Pittsburgh, he ran unsuccessfully for state governor three times, so he had to rely on his day job as lawyer, and when he died in 1847, he was interred in Allegheny Cemetery. Senator Ross was an expert in land use and authored federal, state, and local laws for acquiring public lands. Privately, he developed several communities. Ross County, Ohio, and Ross Township, Allegheny County, PA, are named for him. This brings us to our final questions, “Who were the Ross’s of Missouri with whom our James is buried?” and “Where is Martha buried?” James and Martha migrated west to Missouri sometime before 1885, the year James died, but after 1870, the final year James and Martha are recorded as West Deer residents. A 16-year old boy, Samuel, a possible grandson, was staying with them. He was also listed a decade earlier as Samuel James Gwen (age 5). Could “Gwen” signify a daughter’s married name, and thus indeed, he was James and Martha’s grandson? Or was he a son, conceived when Martha was in her mid-40’s? A daughter of Samuel, Esther May Ross (d.1883), is buried with her grandfather James at Kirksville. She was just 20 months old. We don’t know where Samuel went. The 1880 Federal Census for Benton, Adair County, MO, lists James (age 68) and Martha (age 74) whom we believe to be our family in question. As an aside, censuses ages and dates are sometimes conflicting for various reasons ranging from when the record was taken with respect to birthdays to misprints to memory lapses on the part of the subject. Kirksville, the place of James’ burial, is in Adair County. The website for the Kirksville Cemetery, today a combination of the Forest and Llewellyn burial grounds, lists at least a dozen Ross’s, but only one James, for whom there is no marker. Also, none of the other names match those from West Deer. He died just five years before his daughter Jane. GenForum researcher Bob Horton points out that nearby Fabius Township, Knox County, Missouri, lists several Ross families in 19th century censes (3). Memoirs says that upon the death of James, 75-year old Martha returned to Western Pennsylvania. Was she merely seeking the comfort of her immediate family in her old age, did she go to live with younger sister Harriet, or did she return to care for an ailing daughter, Jane? As of this writing, we don’t know with whom she stayed, when she died, or where she is buried. More research is needed. Research is also continuing on the 9-member household of the widow Catharine Ross (age 60), who appears in the 1840 Federal Census for West Deer. Several sources believe that her late husband, Thomas, Jr., died in 1839. We can only speculate that this was a relative for several reasons: first, the geographical proximity to James and Martha, and second, the closeness in age to a Jacob, listed by name in the 1850 Census, age 34, born about 2 years after our James and apparently Catharine’s son who took care of that family’s farm. Ironically, the biblical names “James” and “Jacob” have the same Hebrew root and were often interchanged European history. We have yet to find Catharine or any of her household in earlier or later West Deer censuses, but one source takes many of the Western Pennsylvania Rosses back to Alexander, father of John (1685-1777), born in Scotland. The family moved to Derry, Northern Ireland in 1689 to avoid the father’s conscription by the British Army. By 1706, John sailed for America and settled in Chester County, Pennsylvania. From there researcher Paul Crawford follows this Ross family westward to Washington and Allegheny Counties in PA and as far as the American frontier will take them. It is possible that our James is part of this family. From our vantage point in the twenty-first century, the bonds among the Scots-Irish in Western Pennsylvania, and West Deer Township in particular, were solid. However, in the case of the Ross, Anderson, and Campbell clans, the connections may appear confusing, with identical first and middle names and geographical proximity, so as to discourage genealogical investigation. Yet, that’s the very essence and thrill of such inquiry and discovery. My desire here is to lay out what others and I have found to date. Then, in the future, this may become a starting point for additional research. As popular author Sandra Cisneros says, “Without the narrative, it’s as if [our ancestors didn’t] exist.” We hope that in this brief expose, we have given our Ross ancestors new life. 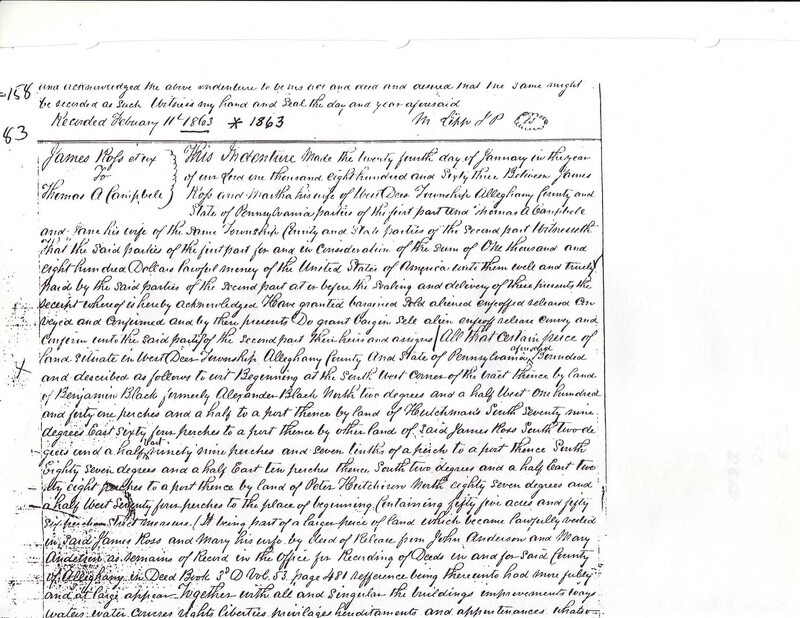 The research of Bob Horton holds the possibility that our Allegheny County Ross family could have originated with William who had served in the French an Indian War and purchased about 500 acres in adjacent Westmoreland County just before the American Revolution began. The only problem is that William’s son James was born in 1801, fourteen years before our James. That James did eventually settle “across the creek” in Plum Township, Allegheny County. What’s interesting is that this James’ son John M., severely wounded at Fredricksburg in the Civil War, worked as a night watchman for the Allegheny Valley Railroad at Logan’s Ferry, which crossed the Allegheny River about half way between Plum and West Deer, where our James lived. Horton also mentions a George (b. 1819) and Jane Ross, also listed in the 1850 West Deer census but who had moved to nearby New Kensington by 1860. Could this have been our James’ brother? Most of their eight children were baptised at the Parnassus Presbyterian that sits at the site of the old fort along the river, and the graveyard there holds a Mrs. Jane Ross, but no George, that we know of now. Parnassus is where the other Ross family attended and where many of them are buried. Were there two Ross families, or are we all related? Just north of Tarentum is the Puckety Presbyterian, which also baptised and buried many Ross’s, but only a partial online survey exists and we haven’t researched that location personally yet. Another old cemetery belonged to the St. James Lutheran Church in Lower Burrell and contains nine Ross’s. When the church disbanded, the family took charge, but it’s unlikely these Lutherans are directly related. Two William Ross’s, one older (b.1784) and one younger (1836-1864) than our James are of particular interest. The Younger, William A. (Anderson?) was killed at the famous Centralia Massacre in Missouri. A look at his widow’s veterans pension application will show his birthplace. Research is planned. Crawford, Paul L. “Descendants of John Ross.” 25 February 2014. FamilyTreeMaker.Genealogy.com. Cushing, Thomas, Ed. History of Allegheny County, Pennsylvania Vol. 2. Unknown: A. Warner & Co., 1889. Memoirs of Allegheny County, Pennsylvania, 1904. U.S. Federal Censuses 1840 – 1880, West Deer Twp., Allegheny Co., PA and Benton, Adair County, MO.